Municipal solid waste (MSW) continues to be a severe problem in India due to poor management systems. 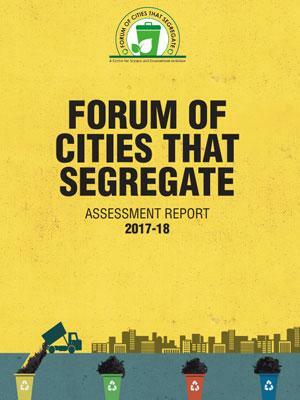 From the collection of wastes to disposal, most Indian cities are struggling to implement an affordable and sustainable model. Urban India alone generates a gigantic 1.5 lakh metric tonnes per day of MSW. Rising incomes, rapidly growing but unplanned urbanisation, and changing lifestyles have resulted in increased volumes and changing composition (increasing use of paper, plastic and other inorganic materials) of municipal solid waste in India. The volume of waste is projected to increase from 64-72 million tonnes at present to 125 million tonnes by 2031. Past few years have observed a paradigm shift in waste management with a major focus towards segregation at source and processing. Solid Waste Management Rules (2016) provide a reasonable framework to address the multiple challenges of municipal solid waste management. Strategic direction and funding by the Government of India through national missions such as AMRUT, Smart Cities and Swachh Bharat Mission have also created an environment in which there is more but by no means an adequate focus on the problem. It is extremely important to translate the vision from the Rules and the Missions into an operational integrated strategy of solid waste management. While the principles of solid waste management are being better understood and more discussed, the attention on the part of city officials to a collection of segregated waste and its transportation, treatment/ processing, recycling and safe disposal is still in a nascent stage. Consumer behaviour patterns in Indian cities have also not adapted to facilitate the process of management of this waste by segregating organic or biodegradable waste from other waste at the source of generation.